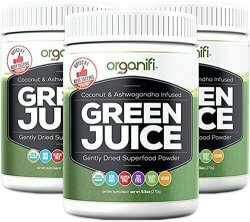 Before we can answer the question does green juice clear the skin, we need to simplify things so they make sense. This is not always easy to do in the world of academic jargon and scientific research. Firstly, what would cause the skin NOT to be clear? What would cause it to show symptoms of acne, psoriasis, eczema and rosacea? Well, if we take it down to the simplest levels, we know everything is ruled by physics and chemistry. So let’s look at chemistry – how many sides are there to it? Which of these sides of chemistry would damage cells? That’s the corrosive side (extreme alkaline can also do the same but this generally isn’t found in nature or the human body) that breaks cells down. Because acne is an acidic condition caused by a systemic buildup of cellular waste in the lymphatic system. When it is clogged and not eliminating cellular waste like it was designed to do via the kidneys as a result of poor lifestyle choices, then it backs up just like your septic tank at home. And when it backs up like this, the body eliminates it via the only exit it can – your skin. 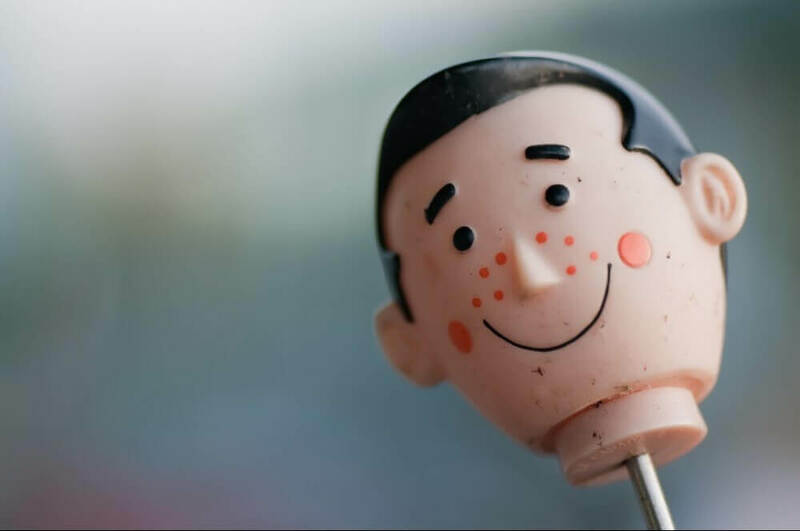 That’s the acne you see which is actually a symptom of an internal problem – make sense? So most skin conditions are as a result of an over acidified body trying to release its toxic load. Now if you’re constantly eating a highly acidic diet, your kidneys will try and neutralise this by producing ammonia. Now if they are in a constant state of ammonia production, this means they are always under siege from acids. Green juices can help put out this fire and take a big load off your kidneys so they can focus on doing what they do best – filter your cellular waste via the urine. So yes, green juices definitely help clear the skin but drinking them alone is no magic cure. It’s no use drinking them if you continue consuming the same high acid forming foods that contributed to your condition in the first place. However combine them with a diet rich in dark leafy greens, fruits and vegetables along with a healthy lifestyle and this will most definitely clear the skin! 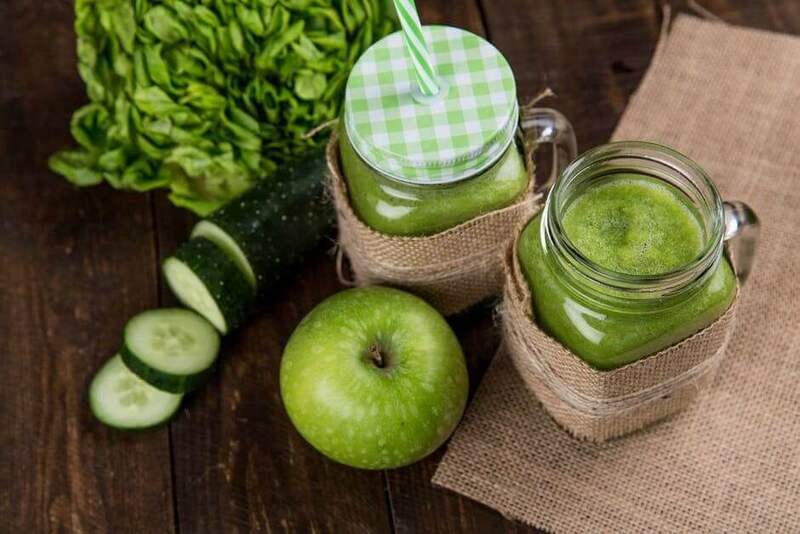 So let’s look at what most green juice is made up of: leafy greens blended with each other with sometimes other nutrients like fruits, herbs and extracts to pack a nutritional punch. These foods fall into the alkaline side of chemistry. They are cooling and healing to the body, nourishing it and neutralising acids as they are metabolised. There are literally hundreds of different green combinations but one of the most powerful is so cheap, so easy, simple and effective, you will not believe it until you try it yourself and see the results. Nothing else – juice celery and watch how ridiculously good it is at helping clear your skin! If you can’t drink it due to taste (it’s somewhat salty due to the naturally occurring salts), add an apple to sweeten it or cucumber which in itself is a skin cleansing boss. If you’re not making your own green juice at home, then just be sure to source it from a reputable, high quality place where the ingredients are pure and organic and they stand behind their product. 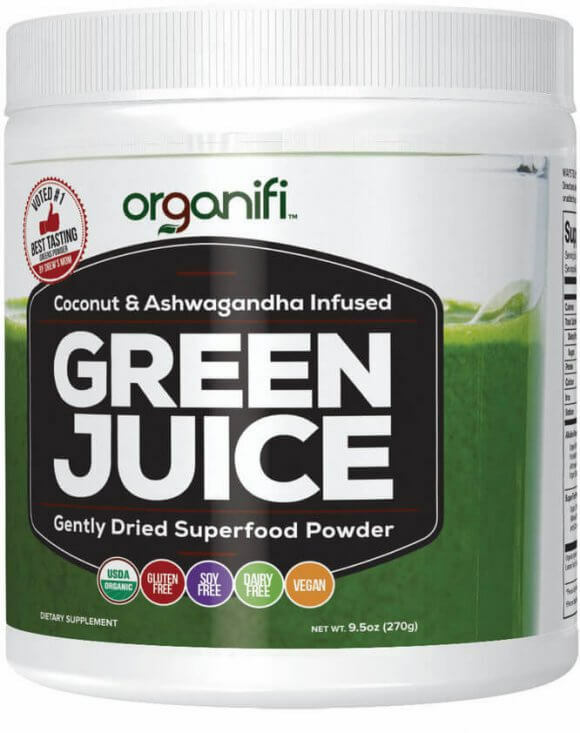 A good quality green juice like Organifi is brimming with phytonutrients, essential vitamins and minerals and it does the job well. 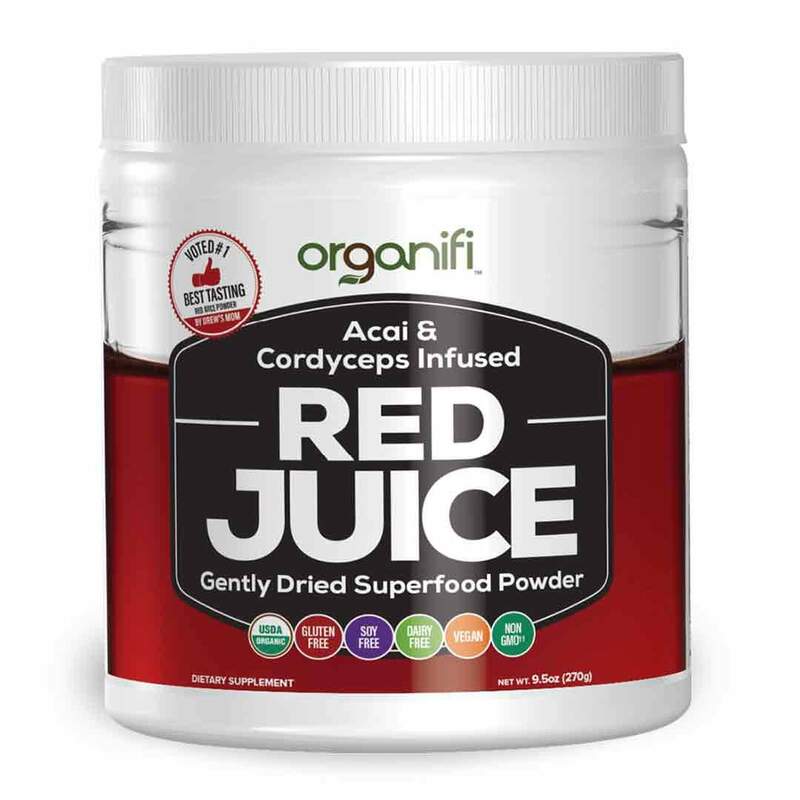 It also contains other very useful herbs like ashwagandha that actively works to boost kidney function alongside other effective herbs like chlorella and spirulina. These actively work with the chlorophyll not just to nourish your cells and purify your blood but to also help hydrate and clean you out you at the cellular level. This is absolutely critical because the less acid load on your body, the less stress and damage you do to your kidneys as they eliminate this to the outside. How Often To Drink Green Juices? like them but I like to have them first thing in the morning and maybe late afternoon. Drink them slowly in small sips and remember to still keep up your intake of fresh fruits, vegetables and legumes as well fresh air, sunshine and exercise where possible. The main thing is to listen to your body and try to make it fun by taking progressive pictures of your skin before and after you consume the green juice. Make sure you don’t confuse your breakouts for “it’s the green juice doing it!” because when you stir up all that stagnant waste inside, it’s bound to result in it leaving your body via your skin and breakouts are inevitable. Be patient and keep doing the right things. Your body will get back into balance slowly but surely and your spots will fade and you will get that healthy, clear skin you’ve always wanted. I really like the way you explained everything on a cellular level. I honestly didn’t know how acne relates to the lymphatic system…and I’m a nurse. Of course, I know what the lymphatic system is, but I never really made the link between that and acne. I’m going to start juicing more often, thanks to you! Super happy to hear that Didi, may you be blessed with a long healthy life and green juice vitality!